Schiff Mega Red Krill oil is a nutritional supplement. It's made by harvesting krill, tiny crustaceans that live in the cold waters off of Antarctica and other icy waters. According to some experts, it's a better supplement than fish oil capsules and has more health benefits. Krill are tiny pink or salmon colored crustaceans that live in cold waters. They're just about one to five centimeters long and look like little crawfish. According to some estimates, there are 500 million of them swimming around the oceans. They're a favorite food of whales and other sea creatures. Like fish oil, krill oil contains omega-3 fatty acids. These are the beneficial fatty acids that reduce inflammation, lower cholesterol, and may prevent heart disease. According to many nutritional experts, humans evolved on a diet that was high in omega-3 fatty acids and low in omega-6 acids. 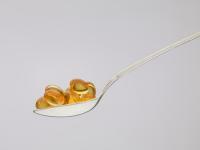 In the modern Western diet, omega-6 acids reign supreme. The heavy use of corn and soy as both animal feed and food additives increases the average person's consumption of omega-6 fatty acids. Foods containing a good amount of omega-3's, such as flax seed and salmon, are rarely consumed in the average Western diet. Yet much research demonstrates that omega-3 fatty acids are beneficial for heart health, to lower cholesterol, and to fight inflammatory diseases such as arthritis. Krill are abundant and multiple rapidly. Many companies and individuals, concerned that over fishing is hurting the environment, turn to krill oil supplements as a healthy alternative to fish oil. Many companies manufacture krill oil supplements, but Mega Red krill oil is produced by Schiff. Like fish oil, krill oil provides many benefits. It is reported to improve cholesterol ratios, lowering the "bad" LDL cholesterol and raising HDL cholesterol. The abundance of omega-3 fatty aids and antioxidants may improve arthritis and other diseases where inflammation plays a central role. Krill oil has a different omega-3 structure than fish oil. Both krill and fish oil contain the omega-3 fatty acids called eicosapentanoic acid (EPA) and docosahexanoic acid (DHA). But the way the acids join together is different in krill oil and fish oil. In krill oil, the links between the acids are joined in what's called a double chain phospholipid. That's closer to the way our own cell fats are formed. Because of this, krill oil is absorbed more rapidly and completely. People who take krill oil claim that this reduces the fishy 'after burp' that's one of the side effects of fish oil. There's almost no aftertaste with krill oil. Krill oil is also an excellence source of antioxidants. It contains an extra antioxidant in the fatty acid chain called astaxanthin. Astaxanthin is what gives krill and shrimp their pink color, and it's not available in many other food sources. It's a powerful antioxidant that protects against UV damage to the skin among other things. A second antioxidant, canthaxanthin, is also found in abundance in krill oil. Krill oil also contains a good amount of vitamins E, A, and D, all powerful antioxidant vitamins and good for skin, eye and bone health. Many fish oil supplements come from fish harvested from questionable waters, waters that may be full of heavy metals and toxins. Fish absorb some of those toxins and heavy metals, which then exist in their oils. According to the Schiff Mega Red website, the krill used to make their supplement is "harvested from pure waters" and is thus low in toxins. When commercial companies fish the waters off Antarctica, their nets can accidentally snag penguins, seals and other creatures who may be killed when the fish are harvested. The Schiff company promises that penguins and other creatures are not harmed while krill are harvested. They claim that the company subcontracted to troll for krill uses special nets that release animals such as seals and penguins safely. If you're allergic to shrimp or shellfish, you might want to avoid krill oil supplements. Krill oil may cause the same allergic reaction as eating shrimp, so it's best to avoid taking krill supplements if you have an allergy to shrimp, shellfish or related creatures. Others may wish to consult a nutritionist or doctor before taking these or any other supplements. If you're looking for a powerful antioxidant, krill oil may be just what you're looking for. As long as you're not allergic to shellfish or shrimp, you may want to give it a try.